The Supreme Lord is self-sufficient. He does not require anything from us and neither our service. If He so desires, He can produce millions of living entities through His energies. It is because Krishna is so kind and merciful that He gives everyone the opportunity to serve Him, as though He required the service of His devotees. He is perfect in Himself. However, if we give Him service wholeheartedly and sincerely, then, by His mercy, we shall make advancement. Basically Krishna wants our love and our interest. And as per our love towards Him, He reciprocates. Chandan Yatra is one such opportunity to engage lovingly in the service of the Lord. During this festival, to beat the blazing heat of the summer, the Lord’s body is anointed with sandalwood paste. Only once in a year devotees get this special darshan of Sri Prahlada Narasimha in Chandan Alankara. Starting from Ekadashi till the day before of Narasimha Jayanti, Lord will give darshan in Chandan Alankara. This year Chandan Yatra of Sri Prahlada Narasimha is held at ISKCON Bangalore from April 26 to 28. Lot of devotees participate in Chandan Yatra services. They grind the sandalwood into a fine paste. 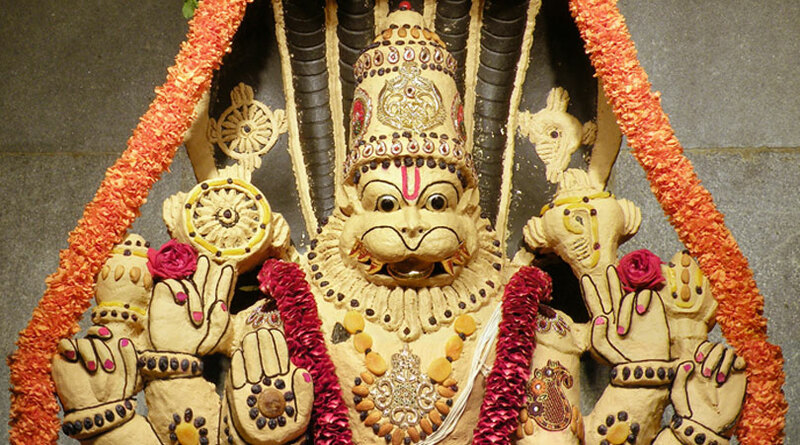 If you wish to grind the sandal paste for Sri Prahlada Narasimha, please contact Sri Srivas Gaura Dasa at +91 9342671723.